My sunset alarm (set to go off ten minutes before sunset in Sitka each day) had just gone off when I heard my phone vibrate, indicating a text message. It was showing up as an image from Connor – unusual, as he has never texted me a photo before. It was accompanied by a text saying simply, ‘end of the park‘. It was a surprisingly orange sparrow of some sort, and I responded by asking him what he thought it was. I quickly followed up letting him know I was on my way. In a race with the quickly fading light, I grabbed my camera and coat, got into the car and headed down to Totem Park. I got Connor on the phone and confirmed that he was still out between the battle site bench and the river mouth. I ran much of the way along the trail through the dark forest and came out to the beach at the battle site bench. Connor was standing out on the flats and kept watch while I walked along the flat drift-log strewn area being overtaken by vegetation (though recently trimmed, and so now quite open). As I approached not far from where he had last seen it land, an unexpectedly small bird took off, flying low up and over the beach grass than further down the shore between the beach grass and piles of seaweed pushed up by the previous high tide series. I lost sight of it behind the beach grass as it followed the gentle curve of the shore, but Connor saw it flying and also where it had disappeared in the beach grass, telling me he was pretty sure it was the bird he had seen before. The light had been marginal when I arrived, and was fading more as I continued my walk. Despite going somewhat near where Connor had seen it go into the vegetation, we didn’t see it fly again. I went down to talk with Connor and see the pictures on his camera. The picture accompanying this post is one I took of the LCD on his camera showing one of the better photos he got. He told me that he had flushed it while walking along, and it hadn’t flown far. He pished a bit and it popped out enough for him to get the photos before flying further down the beach. At that point he texted me and waited out on the tide flats to watch, not wanting to fly further away. He was confident he had seen it in the bird book previously, but didn’t remember the name off the top of his head. 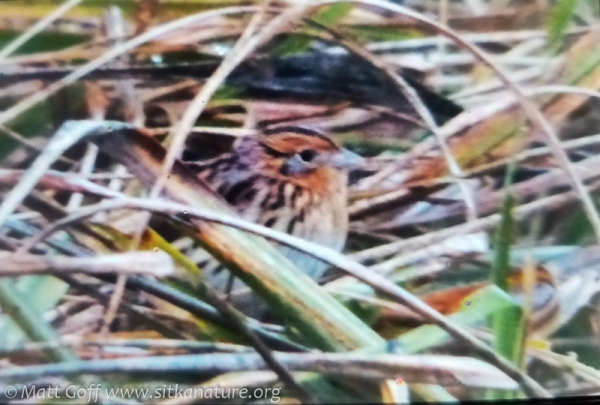 LeConte’s Sparrow has never before been reported from Alaska, and reading up on them, Connor did well to see this bird at all, let alone get a picture of it. They are one of the smallest North American sparrows and apparently notoriously reluctant to flush. When they do flush, it’s only after a fairly close approach and they fly low for short distances. Instead of flying, the usually will run along the ground underneath the vegetation. Hopefully the bird will stick around, and maybe even provide some better looks.